1. Preheat oven to 375. Place frozen, wrapped fish fillet in cold water bath. 2. In a bowl, whisk together vinegar + sugar until dissolved. Start to add olive oil, celery seeds, salt + pepper. Toss in cabbage and coat well. Cover and let sit for ~1 hour. 3. In a medium bowl, combine the tomatoes, onions, mango, avocado, jalapeno, garlic, cilantro, salt, and pepper and squeeze half a lime. Sprinkle salt and pepper to taste. 4. Lay defrosted fish on a sheet of aluminum foil. Drizzle olive oil, sprinkle salt + pepper + whatever other spices you enjoy onto both sides of fish. Completely wrap fish in aluminum foil and place in oven, directly on the rack. Bake for 15 minutes or until flaky. 5. Unwrap the fish and use a fork to flake into desired bite-size pieces. 6. Fill each tortilla with the fish and a generous spoonful of the salsa. Garnish each plate, as desired, with a lime wedge and the cilantro sprigs. It’s easy to think tacos need to be a huge kitchen production with tons of toppings. 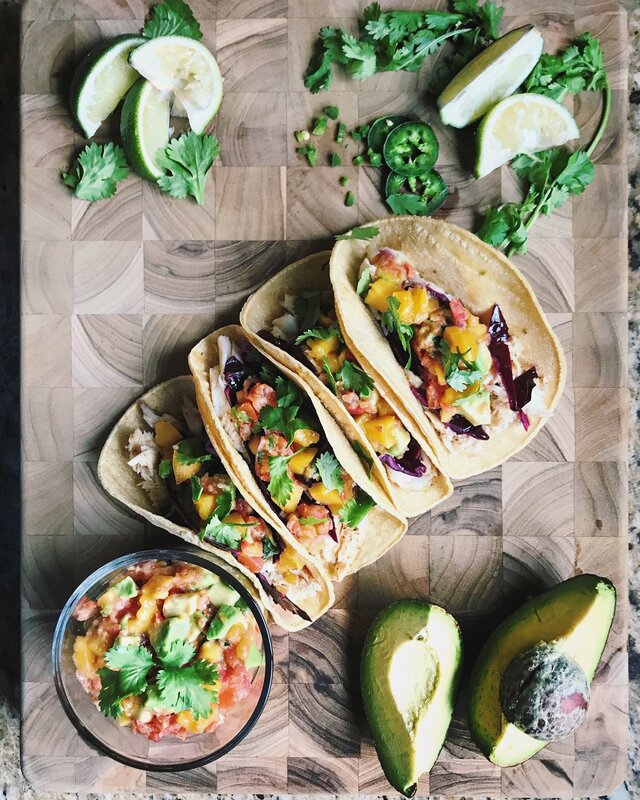 But it doesn’t always have to be – especially with these Barramundi Fish Tacos with Mango & Avocado Salsa from Jamie Lopez, RD. Tacos don’t really need 10 different toppings to be delicious. Simplify it for a quick weeknight meal by minimizing ingredients or buying pre-made salsa.